Wooden xylophone base and metal plates. Colorful educational xylophone toys enhance babies' color identify ability. Musical xylophone with clear sounds to teach babies' identify different scales. Toddler xylophone: Recommend ages 2 and up. It's a good gift idea. Babies are intuitive music-makers, they love to explore musical concepts with this adorable twist on a instrument toy. The colorful keys serve as visual guides for the different tones and help toddlers to compose a song. Ideal gifts for babies, preschooler boys and girls, the xylophone toy helps children explore simple musical concepts. The toddler toy is a musical instrument toy that also as a educational toy. The xylophone is a percussion, it's similar to glockenspiel, vibraphone and marimbas! The difference between them is material, either wood or metal. 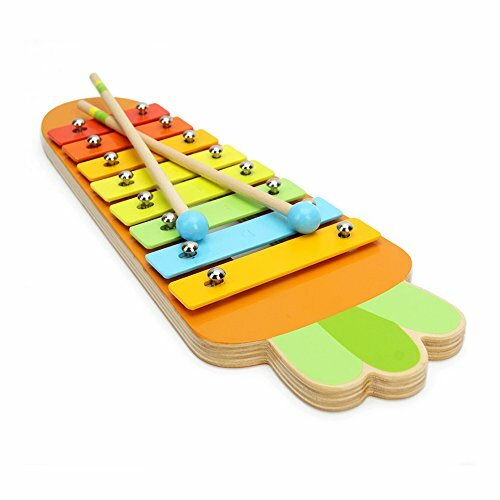 The xylophone toy is made of wooden base and colorful metal keys, exercise kids' creativity with musical toys and let your child learn and enjoy clear sounds. The mallet is easy for small hands to grip! Learning to play with the mallet is also great for fine motor development and hand to eye coordination. xylophone for Toddler.Recommend ages 2 and up. It's a good Christmas gift idea. If you have any questions about this product by Baidercor, contact us by completing and submitting the form below. If you are looking for a specif part number, please include it with your message.